Battle Day includes a reenactment of the Battle of San Pasqual. In this photo a U.S. dragoon is shown with sabre drawn. California State Parks and the San Pasqual Battlefield Volunteer Association will present San Pasqual Battle Day Dec. 2 11 a.m.–3 p.m. at San Pasqual Battlefield State Historic Park. 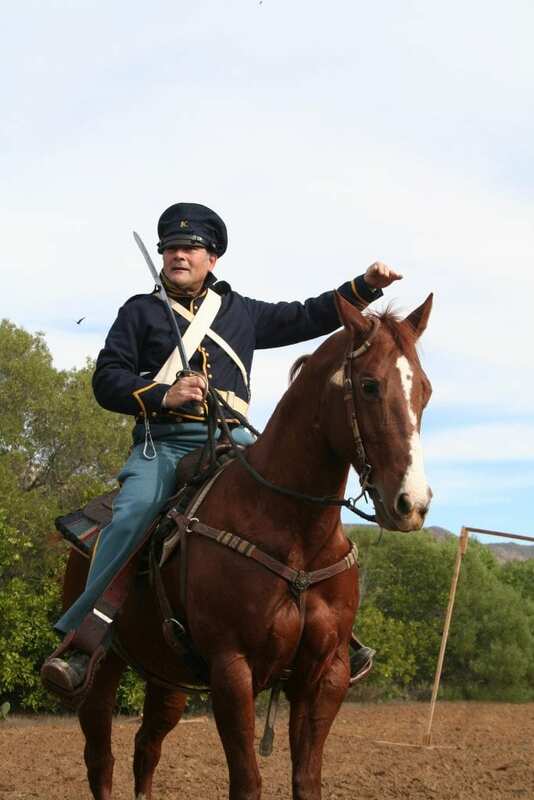 This annual, family friendly, North County event focuses on the interpretation and commemoration of the 1846 Battle of San Pasqual, the bloodiest battle fought in California during the Mexican–American War. This year the event will have enhanced living history activities that will transport visitors to the battlefield 172 years ago. Visitors will have the opportunity to watch the cannon crew fire a 12-pound Mountain Howitzer. They will be able to listen to the “Battle Story” told through the eyes of a U.S. Dragoon and a Californio soldier. They will experience life as a new recruit, as visitors go through a 19th century military encampment and smell the aroma of period food as the camp cook prepares a hearty meal for the hungry troops. They will also be able to walk through the encampment area and witness life among the soldiers. Free event parking will be located at the San Diego Archaeological Center – upper field. Battle Day is sponsored by the San Pasqual Battlefield Volunteer Association and California State Parks.